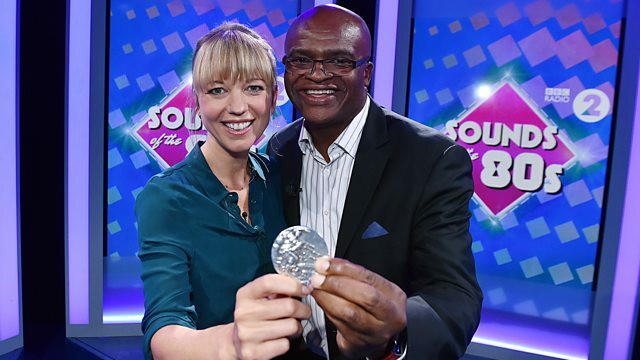 A stadium full of sport inspired 80s music videos with Sara Cox, including an impassioned look back by Olympian Kriss Akabusi at his 80s triumphs and the songs that inspired him. With the summer of sport in full flow, gallop back to a stadium full of sport inspired 80s music videos with Sara Cox. Sara is joined by Olympic athlete Kriss Akabusi to take a look back at his triumphs from the decade and how music inspired both him and the nation. Alongside tracks which motivated Kriss, such as Soul II Soul's Back To Life, Sara brings you classic 80s tracks from sporting events, including Everybody Wants to Run the World by Tears For Fears and One Moment in Time from Whitney Houston. Sara also serves up some very special 80s moments, such as Snooker Loopy and Chalk Dust! It's pure musical sporting gold. Plus your regular chart countdown, back-pedalling to mid-summer of the last Olympic year in the 80s, with a run-down of the Top 5 from this week in 1988. Get set for the Olympics 2016 with these musical highlights. Special performances, events and programmes, exclusive to BBC iPlayer.